“Trying to survive… Also studying athletic training pre-physical therapy." Where are you studying and what year are you? “I’m a junior at Wheeling Jesuit University." "Since 8th grade so... eight years"
3. Singing in the Lux concert last summer"
“I make better cookies than Robby. I don't remember exactly how it started, but back in high school I would always send Robby pictures of the cookies I baked and he would try to retaliate with his inferior ones but mine were always better. Unfortunately, I don't think he ever got to try them." "Eric Whitacre. I first fell in love with choral music when Robby showed me Alleluia. I never would have ended up in Lux if it hadn't been for his music." “I hate picking favorites. I’ve been going through a Sarah Bareilles phase. A very long phase." “Mad Crazy Love by Tenille Arts." If you could eat a meal with Bill Nye the Science Guy, what would you order? “If he’s treating, I would choose whatever the most expensive meal was as long as it looked good!" "Um I don't sports. So I guess the Nats by default or the Patriots minus all their issues." "Music makes me happier than anything. Lux is the most talented group of musicians I've ever sung with. It not only challenges me, but provides an experience and exposes me to songs and genres I don't get any where else." “Entreat [me not to leave you, by Dan Forrest]." "If you tried to guess my nationality, 9/10 anything you say will be correct." Bernadette Tirador has sung six seasons with Lux, beginning with the first mixed recording session affectionately referred to as “The Singy Thingy”. She has been singing in choir since 8th grade, including St. Jerome’s Church choir where she first developed a love for sacred music. Bernadette dabbles on the guitar and pretends to play piano, but mostly deafens her family and neighbors with dishwashing arias. She studied voice for four years under Elizabeth Roberts, and is now a student of Michelle Orhan. 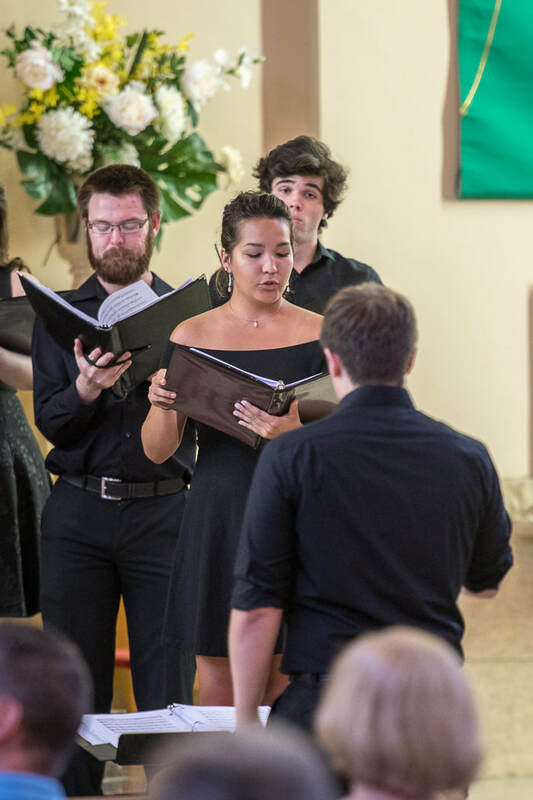 Bernadette is a senior pre-Physical Therapy Athletic Training major at Wheeling Jesuit University, where she sings in three ensembles, one of which she directs. She was the 3rd recipient of the Mount de Chantal music scholarship at her university, and has been an active member of the theater department since her freshman year. Aside from many plays, Bernadette has appeared in the musicals Cabaret, 42nd Street, and Pippin so far with the Theater Guild, and is very excited to continue doing musical theater for the rest of her college career. (Oh and Lux too).